This story is about creativity, cooperation, openness and risk-taking. The door was open, so I looked inside. Romain greeted me with a broad, friendly smile. I asked, “Do you speak English?” Out came a resounding “YES!” And so our happenstance encounter evolved into a conversation and tour. 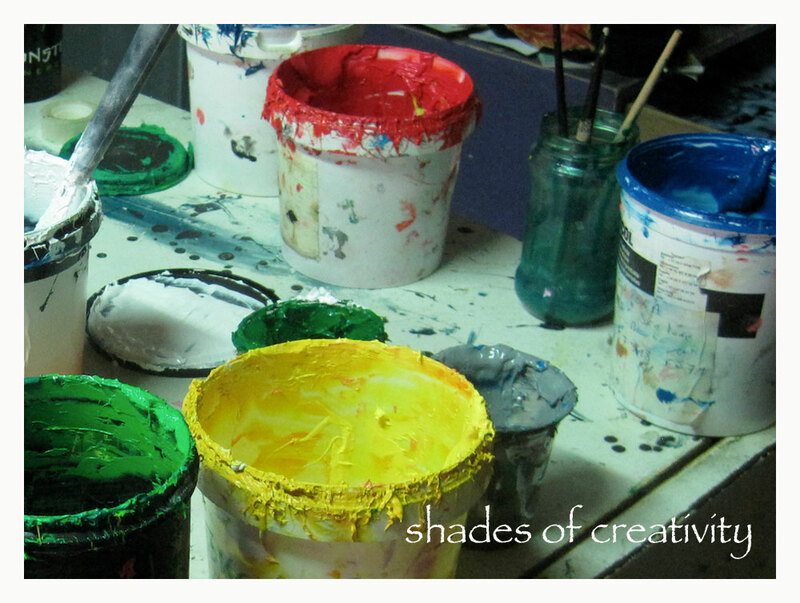 Initially, the unmistakable look of creativity in the making is what attracted me. It was everywhere—floor to ceiling, from the front door to the back room where they keep the wheels. Yes, I said wheels. I’ll try to explain. Lyon, France is a vibrant city, filled with lots of young energetic, creative people. 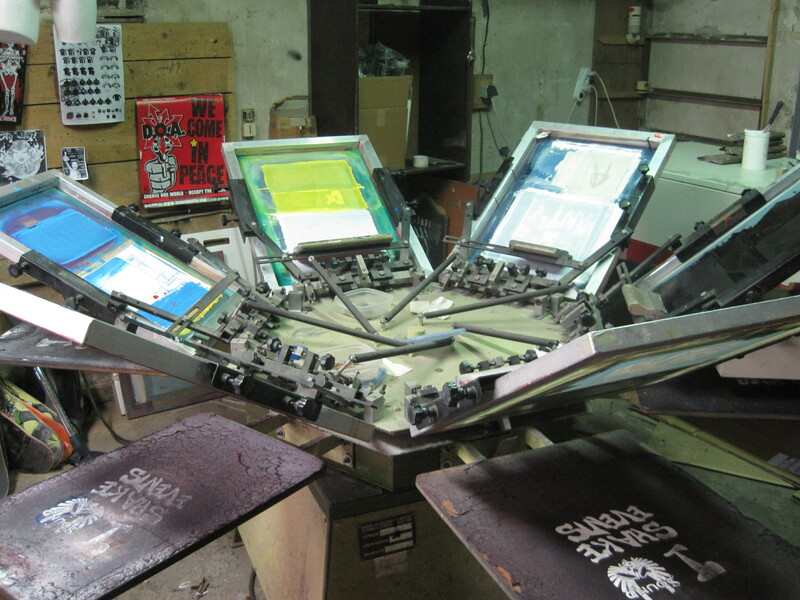 Romain recently moved his silk-screen printing business called Seri’Z, from the small town of Oullins to Lyon. I asked him how it was going, and he said “crazy”—like in a good way. As I thought about it, Lyon was the perfect choice: one of the largest cities in France, and the past European leader of silk manufacturing for several hundred years running. And since soie, silk is the city’s heritage, why not locate a silk-screening business in the heart of the historic Croix Rousse silk district within the city. I had to agree. The idea seemed perfect! Romain spent the next 30 minutes patiently answering my questions with enthusiasm and clarity. He took me through the various steps of the process and explained that he even likes doing the small jobs that nobody else wants—and there are plenty of them to keep his one-man shop on the move. At one point, while trying to convey the idea of “silk” to me, he paused, and wasn’t quite able to come up with the right word in English. Without hesitation, he darted out the door and into another shop across the street. I followed close behind as I didn’t want to miss anything. 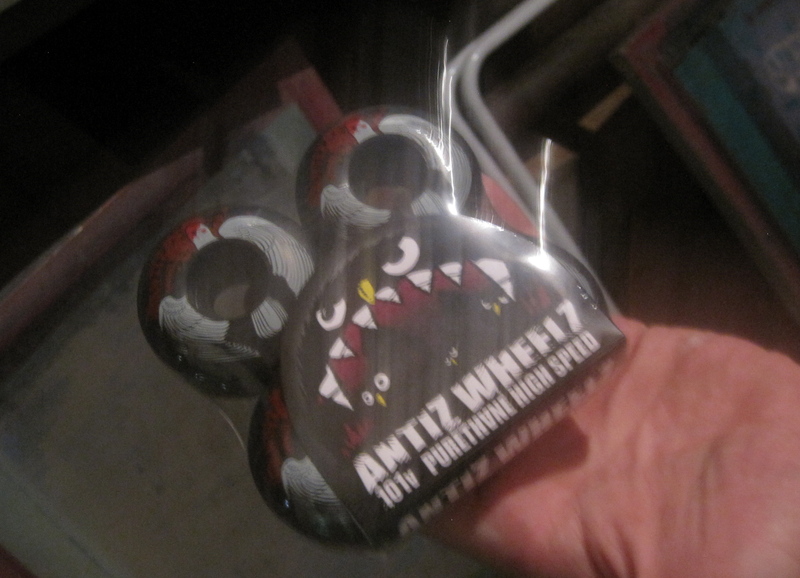 The shop was called Antiz, and was run by his friends Hugo and Julien. 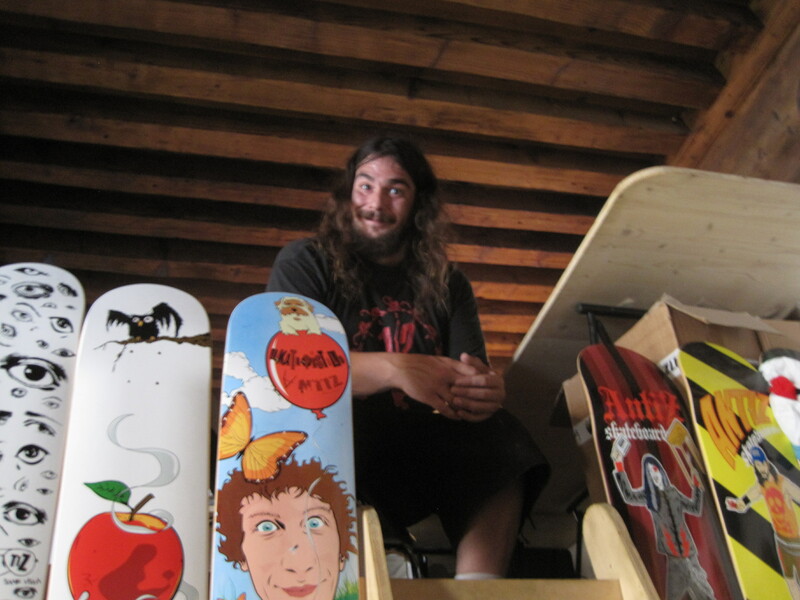 Antiz is a custom graphics shop for skateboards. Going to the back of the relatively small room, where the two guys were working away on computers, Romain quickly climbed a makeshift wooden ladder to a tiny loft space where he could barely stand up. He needed some help from the internet. It seems that the high-tech hide-out overhead is a shared “office” for both businesses. Very cool indeed! Ah . . . ! That explains the wheels over at Romain‘s place—skateboards! It felt like one business in two locations, but instead, it was really more like two businesses in one. What I discovered that day were some young, creative, successful French entrepreneurs, making it all happen. Low overhead, high energy and consistent quality must be their strategy. And it’s a good one, because the graphics business seems to be “on a roll” in Lyon these days! Note: You may also be interested in some of out other stories about our time in France.